I love working in new and unique locations, so I was delighted with this bride asked if I'd be willing to travel to Samode Palace, approximately one hour outside Jaipur, India, to photograph her wedding. Having already been to Jaipur, but never to Samode, I immediately said yes. Getting there was an odyssey involving a driver who sang off-tune for hours, and who almost killed us several times. But the crazy travel was worth it, as Samode Palace was glorious. The palace itself was completed in the 16th Century, and you can almost feel the history soaking into your skin as you walk this palace's ornate halls. Adding to the palace's ambiance were the local animals, who were keen to visit the palace guests. Monkeys darted down from the trees to walk the palace's balconies or visit the breakfast area, and a parade of goats click-clacked down the marble steps in a nearby hill every single afternoon. If you've never heard hundreds of goats click-clacking down hundreds of stairs, believe me, you're missing out on a wonderful sound. The bride and groom actually met as students at MIT, so brilliance will no doubt abound in their family. While my second photographer was shooting the groom's entrance (which included a parade of elephants and camels, as well as a band), I hung back with the bride, who was watching the baraat from a window. 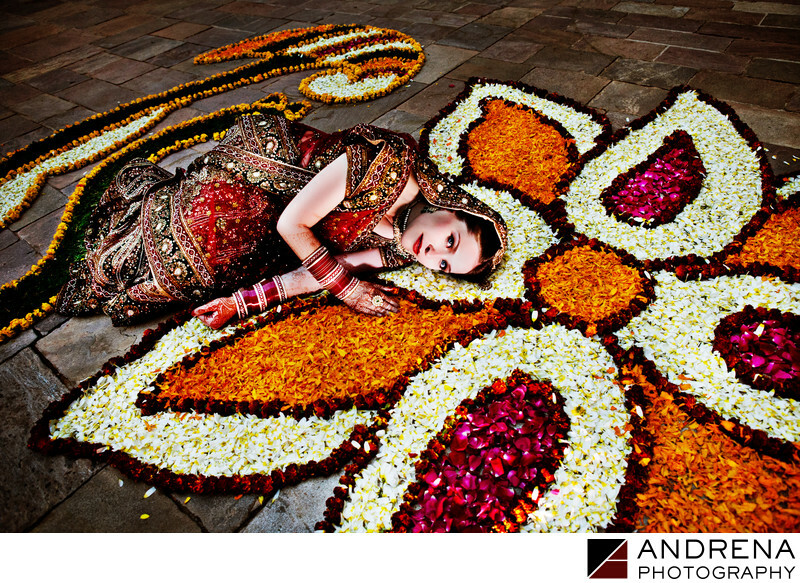 When it came time for her to proceed to the ceremony area, I noticed that the hotel staff had put down intricate floral decorations on the palace courtyard floor. I turned to the bride and said, "Would you be willing to lie on the ground?" And even though she was just about to get married, and had just spent hours getting ready, she said, "Of course!" I then laid on the ground to show her what I wanted her to do, and then she got into the exact same position so I could capture this stunning portrait. I used off-camera lighting, which added to the drama of this image. It simply would not have looked the same if photographed without lighting. The couple loved this photo, and chose it for one of their album covers. Destination Indian wedding photographed at Samode Palace in Samode Village, near Jaipur, Rajasthan, India.